"It is an old maxim of mine that when you have excluded the impossible, whatever remains, however improbable, must be the truth." Subtrope of Trial-and-Error Gameplay. The inevitable process where, lacking a guide or any hope of solution after they'd exhausted the saner, more rational responses, people will, out of frustration, resort to using every single item/trying every option with every other item/funnily shaped spot on wall/steampunk eggplant. As the reasoning goes, you've tried everything else, why not Try Everything? Has varying chances of success and limited efficiency, but sometimes it's the only option. In real life too (commonly referred to as "Brute Forcing"). Can lead to people shouting, "Guide Dang It!! ", because, really, if you're just trying everything rather than reasoning through it, it's just as brainless as consulting a guide — and it takes a lot longer. Related to Solve the Soup Cans, where it's about situations that are impossible unless this is employed. Also related to Speak Friend and Enter, where the solution is so obvious that you Try Everything before you consider it. See also Million-to-One Chance. Compare Talk to Everyone and Combinatorial Explosion, where the developers have the headache of coping with lots of items and only one way to do it. If the game tends to say "I Can't Use These Things Together" or "You Can't Get Ye Flask", a player who is Trying Everything will get very sick of hearing it. This is an interactive version of How Do I Shot Web? May result from Enter Solution Here. Not to be confused with the Shakira song from Zootopia. In any game which has a numeric keypad (or similar combination lock) as an obstacle, brute-forcing it is usually a viable option unless the designers thought ahead and made the passcode prohibitively long or actually required the code to be found in the story first. This is especially true if the solution is split into parts; you only need enough parts to narrow it down to a reasonable cross section of answers. The old computer axiom PLOKTA (Press Lots Of Keys To Abort). Ritually performed by spreading both hands wide and mashing the keyboard in an effort to make your computer respond. When things get really bad, there's also the unidentified scrolls game, which has a wider, riskier range of consequences. Resurrection? Destroy Armour? Summon Greater Demon? Teleport? or Dig? The codec frequency for Meryl in Metal Gear Solid was actually given on the back of the game box, leaving the people who didn't work this out to resort to calling every frequency, because you couldn't progress without it. The Colonel does say that it's on "the back of the CD case", but Snake was given a CD in-game not long before that you can't examine, whence stems much confusion, especially if you're not familiar with Metal Gear's trademark fourth-wall-breakery. This was also a detriment to people who didn't have access to the CD case for either borrowing or renting the game, and thus had no way of finding out what it was even if they did know what the Colonel was talking about. Luckily, the needed frequency in question happens to be very close to the logical starting point of 140.00. There was a similar experience in the original NES Metal Gear, made even worse by the fact that he would only answer your calls if you called him from certain rooms. In Professor Layton, solving many puzzles simply requires inputting a letter or single-digit number. Players who are stumped can Try Everything by going through the entire alphabet or number line until they hit the right answer. You lose picarats for getting wrong answers, but only up to twice per puzzle, so if you've already gotten two wrong answers you have nothing to lose by doing this. Some puzzles, however, have no brute-force method. And others have multiple digits or use entire words; in those puzzles, trying the brute-force method would take ages. Lampshaded in Diabolical Box where one of Layton's lines after getting a puzzle wrong is "Well... I suppose that's one possibility eliminated." Averted for most locations in most 2D Metroid titles because the Power Bomb will clear the screen and reveal any destructable blocks. During the courtroom segments of Phoenix Wright: Ace Attorney, players who are stumped as to which piece of evidence to present often resort to Save Scumming and simply try presenting every piece of evidence until they get it right. Doing this out of court has a running gag of Wright showing off his Attorney's Badge, something nearly every NPC responds to. Main characters (such as Maya and Gumshoe) will note he has shown them before. If you're Genre Savvy, you never even bother with your attorney's badge, just to save time. Which will screw you over in 1-4, since it's the only item that gets the old guy to respond. In the following case, if you show your badge to Gumshoe, he will still say you're "always flashing it around", despite you never having shown it to him before. A similar event happens in 2-2, where showing your attorney's badge to not-Director Hotti is the only way to convince him to share information with you regarding Ini Miney's accident. And in Trials and Tribulations, this will screw you over, in that the response for the correctly used item is the exact same as the usage for everything else. Well, for about 3 panels in, but if you're trying everything, that's all you're going to look before you reset. Some of the games will actually punish players for trying to brute force their way in the trials by making it where the penalties are so high that sometimes you literally just have one shot to get it right. Of course, this will induce more Save Scumming. 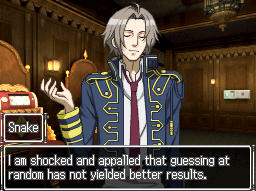 Apollo Justice: Ace Attorney and Dual Destinies take most of the fun out of Trying Everything outside court rooms—witnesses would previously give unique and comical responses to irrelevant pieces of evidence, but now they will give the boilerplate "I don't know" dialogue unless the key item is presented to them. Dual Destinies practically encourages Trying Everything with the Mood Matrix, which only has four options for every statement in a testimony, incurs no penalties, and occasionally veers into Moon Logic Puzzle territory. Apollo: Yes! Nice one, Athena. Keep it up! I don't care if it's totally unrelated to the case or just plain annoying or even embarrassing. Just keep presenting evidence without any regard for others! That's the first step towards becoming a successful trial lawyer! Athena: Leave to to me! I'll present one piece after another, and then another! The first two Discworld games suffer from such ridiculous (albeit hilarious) logic that this is required more often than not. In the fifth episode of Strong Bad's Cool Game for Attractive People, when Strong Bad calls Videlectrix and asks for a tip on how to complete a Videlectrix game, he is advised to try to use everything with everything. Although A Vampyre Story mostly averts this trope, it has one puzzle that appears to be designed around it — you have to take an item from a stack of several, try to use it, return to the stack, notice that one of these things is not like the others, then take that and use it to solve the puzzle. The problem is that until you try using the incorrect item the game won't acknowledge that there's anything notable about the rest of the stack, nor will it give you any other hint that might suggest a need to return to something you've apparently exhausted. It looks as though the designers expect you to get desperate and start trying everything to eventually bring you back to the stack to find out that "hey, this one looks different, let's try it." Theresia: Dear Emile does its best to avert this by way of Booby Traps. Clicking on everything tends to result in getting peppered with arrows or stabbed by a flying knife. One method is lightning bolts. It even warns you about this in the manual. It even shows you a picture of exactly what will happen to you. These usually are used when the developers don't want you to just whip everything in the room to try solving a puzzle. Sometimes this behavior makes sense, because Lemeza is nominally an archaeologist; sometimes it just seems cruel. The lightning bolts are particularly evil because the game has optional collectibles, some of which can only be found by randomly whipping every wall looking for secret areas. Then again, they are mostly optional. Other times, this type of behavior is discouraged by only giving you one chance to solve a puzzle. Scribblenauts actually encourages you to do this, and they really do mean try everything. PHANTASMAGORIA! The game where sometimes clicking on rats makes things happen and sometimes they don't happen! There's no real way to progress other than to just do absolutely everything you can. Being an Adventure Game, Telltale's Sam & Max: Freelance Police games include some of this. Of note, though, is how the manual encourages the player to try shooting everything and anyone with Sam's gun. This almost never solves anything, but the responses are often quite hilarious. The only way to solve the mining laser puzzle on Therum in Mass Effect is to keep trying until you get it right. The barrel puzzles in the Fade in Dragon Age II avert this. If you don't solve them within a certain number of moves, they vanish and a bunch of demons show up to attack you. The players in DM of the Rings respond to the entrance of the Moria mine in this way. They are on their way to chop down some trees to construct a battering ram when the DM ends up screaming the answer to them in frustration. StarTropics: The robot in the submarine will at some point ask you to enter a frequency to continue. You cannot progress until you do. Have you lost the letter that came with the instruction manual and are instructed to put in water? Well, it's only a three digit code, you can just try them all one by one. The answer is 747. Quite common in Text Adventures (and other Adventure Games as well), where players tend to pick up everything and, when confronted with a puzzle, immediately try to apply everything to it. A variant is the "guess the verb/noun/adjective or pronoun on rare occasions" puzzles, where the player has no choice but to resort to trying every variation on "use the thing on the other thing" until they find the right combination of verbs and nouns. For example, in one real-life example, "use whip on lion" gives a failure message ("You're too afraid of the lion!") while "whip lion" works perfectly. This is more or less the only way to collect all the voice clips in Baroque if you don't already know how to get each one. Punch every NPC, hit every NPC with a sword, shoot every NPC with your BFG, give every item to every NPC; repeat every time something plot-significant happens. Add to this the fact that there are over 300 items in the game, some NPCs only show up on certain floors of the Neuro Tower, and every floor is randomly generated... yeah. It gets pretty ridiculous. And yes, some of these are permanently missable. In The Tower of Druaga, uncovering the Inexplicable Treasure Chests could require passing through a certain set of points, killing enemies in a specific order, entering a particular combination of controller presses, or any number of other things the game couldn't be bothered to hint at. Players without a guide could consider themselves lucky if they figure out how to get the treasure on a floor and exit before the timer ran out and not have it be a poison potion. Of course, even players who tried absolutely everything were doomed to fail on the couple of floors where the treasure was a Missing Secret. Grim Fandango normally gives the player enough hints to avoid this trope (provided you examine everything and talk to everyone), and the lack of a way to combine items simplifies things even further. Year 2, however, has one puzzle which requires you to figure out the purpose of a slip of paper with the words "Rusty Anchor" on it. There's exactly one direct clue as to who might be of help there, and if you missed it (or haven't been to that place yet), the only solution is to show the paper to every character in the town — which can result in interesting answers, up to and including beat poetry and a piano ballad. It becomes very obvious that the game actually expects this behavior, when, upon finding the right person to ask, the first thing you hear is "You mean, besides the song, and the poem, and the bar, and the statue by that name?". Almost the exact same situation occurs when you receive a mysterious token with a number and meaningless word written on it. It turns out that this a coat check stub, but you will only find that out by showing it to everyone you meet until you end up at the coat check girl. Three of the games in the Mental Series, these being The Journey, In the Woods and Mental Showtime, all encourage this, stating that clicking on everything to find the solutions is the best way forward. A lot of Escape The Room games are so tricky that the player is left to literally use/combine every single item in their inventory, no matter how ridiculous. Sometimes this works, and sometimes the solution is so absurd that it results in a Moon Logic Puzzle. One way to find Ad-Lib notes in Groove Coaster in order to maximize score and get Full Chains is to invoke this trope and just tap any time there isn't a note immediately ahead. You'll probably get a lot of GOODs but at least you'll know where they are next time. A few puzzles have few enough possible path combinations that it's entirely possible, albeit time-consuming, to brute-force them. Many sets of panels attempt to prevent this by shutting off the current panel on failure, making you have to return to the previous panel and re-solve it (your previous solution remains visible, though). Generally, the first few tutorial puzzles for each new symbol expect the player to brute-force them, then look back after three or four puzzles and spot the pattern that allows them to deduce the rule for that symbol. The Journeyman Project, as part of its Copy Protection, asks the player to input eight-digit passcodes at three points during the game. You can either do what the game intends you to do and obtain the passcodes from the manual...or, noticing that the game checks each digit as you go along and will explicitly invalidate the password attempt as soon as you enter the wrong digit, try every single number for each new digit you get to. At worst, you'll have to retry about 70 times per passcode (as opposed to 10 million if the game only checked your passcode once you've entered every digit). One issue of Justice League Adventures had The Flash attempting to disarm a bomb wired to a keypad that required a three-letter password. Being The Flash, he simply tries EVERY three-letter combination at lightning speed, starting from A-A-A, A-A-B, etc. The disarm code turns out to be O-F-F.
Mr. Bean's Holiday: After Mr. Bean's antics cause a father to miss his son's train, and the next train skipped the stop his son was at, the father put the phone number of his hotel room in Cannes up to the window. Unfortunately, the last two numbers were blocked by his fingers. Mr. Bean's solution is to write down every double-digit number from 00 to 99 and call each completed phone number. Subverted, as father and son are reunited before the call was made (none were seen onscreen after 06). Idlewild presents the human race with a puzzle in the form of a Depopulation Bomb disease. The only success was a crazy mishmash of genetic and sociological sampling from around the world, bioengineering a novel immune system, multiple sterile safehouses, tons of drugs, virtual reality, and artificial intelligence. In the 4th episode of Kaizoku Sentai Gokaiger, after the previous episode, where the Gokaigers were granted a new power for their Combining Mecha by Magi Red, the Gokaigers try out the other Ranger Keys to see if they do anything. We only see them using the JAKQ and Battle Fever keys, but it's implied that they tried all the other keys with no results, realizing that they have to be granted the new powers by the respective Sentai teams. In the Looney Tunes cartoon "Ali Baba Bunny", Bugs Bunny and Daffy Duck tunnel into the cave of a wealthy sultan. Seeing this, the sultans guard Hassan tries to activate the password (which is, Open Sesame, naturally) only to realize he has forgotten it, so he rattles off several different S-words (Uh...Open, sarsaparilla? Open, Saskatchewan? Open, septuagenarian? Open, saddle soap?) before eventually getting it right. My Little Pony: Friendship Is Magic has the Cutie Mark Crusaders, who don't have their Cutie Marks yet. Since they're desperate to get their Marks, they try everything from paper authors, catapults, sports, chicken catchers and several other things to get their marks of adulthood. All with accompanying Mad Libs Catchphrase of "CUTIE MARK CRUSADERS (Insert name of attempted job here)!" Justice League: In "A Better World", Flash tries to open a combination lock by entering all possible combinations at superspeed. Averted when Batman tells him to try his combination, guessing (correctly) that the Alternate Universe Batman who set the lock might have used the same one. Averted in Gravity Falls when Dipper is trying to access the Author's laptop and, not knowing the password, tries every possible combination he can think of that's associated with the Author. Unfortunately, it turns out that too many failed attempts triggers the laptop's fail-safe and nearly erases all the data. Security experts refer to something that tries to guess passwords by trying all of them as a "dictionary attack" (i.e., try every word in the dictionary), or a more thorough "brute force attack" (try every possible combination of letters/digits/symbols/etc.). A similar method, called "rainbow table", consists of getting one's hands on an encrypted password and comparing it with a huge table of possible passwords and their encrypted equivalents.note This is because good encryption methods use a "trapdoor function" : basically, even if you know the encryption key, you can't directly reverse the process without a different key, or a brute-force effort that dwarfs the rainbow-table approach. The exception to this is the one-time-pad cipher; if you try brute forcing a one-time-pad encryption, you end up with literally thousands to millions of interpretations, and no way to know which was the correct one (that is what the key is for). On a meta level, dedicated attackers will scout every possible opening on the system besides user credentials (and indeed there are often many; social engineering attacks, cross-site scripting, known vulnerabilities for individual applications,...), then try breaking in through all of them, starting with the ones more likely to succeed or least likely to leave a trace. Some security systems counter this approach by freezing up if too many wrong guesses are entered and/or imposing a significant (and often increasing) time delay after each wrong guess. Websites that require this in order to navigate the site are known as having "mystery meat navigation." MMN is a highly frowned-upon practice, as it can mislead users into believing that there is less content on the page than there really is.